CNC lathes are rapidly replacing the older production lathes (multispindle, etc.) due to their ease of setting and operation. They are designed to use modern carbide tooling and fully use modern processes. The part may be designed and the toolpaths programmed by the CAD/CAM process, and the resulting file uploaded to the machine, and once set and trialled the machine will continue to turn out parts under the occasional supervision of an operator. 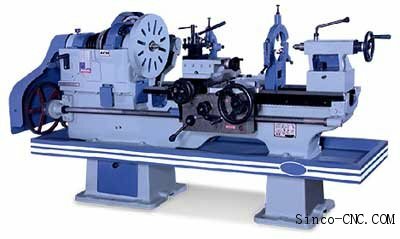 We are the leaders when it comes to Heavy Duty Lathe Machine; these are unsurpassable in output and sturdy in features. Same is the case with our Mechanical Lathe Machine which is made of heavy and pure iron which is obtained from the best of vendors these are highly useful in heavy metal industries and gives you scathe free performance year after year. The machine is controlled electronically via a computer menu style interface, the program may be modified and displayed at the machine, along with a simulated view of the process. These machines are often set and operated by the same person, where the operator will supervise a small number of machines (cell). feedscrew and leadscrew work together with the spindle to make the correct amount of screw threads on the work that you are doing. within the carriage is the tool bit that turns either in a perpendicular or longitudinal direction depending on how the operator controls it.